The sound was my stomach grumbling. To be precise, it was a hollow gurgle, pulsating rhythmically with each of my footsteps, like a baby not quite enjoying a “horsey ride” at 170 bounces per minute. I was 45 km into the 50-mile (80km) Haliburton Forest trail race, shuffling ever closer to “farther-than-I-had-ever-shuffled-before” territory. And it was lunch time. I had signed up for this madness on the last day of registration, two days before the actual event. It’s not that I wasn’t committed: at the beginning of 2015 I had inexplicably decided to run a 50-miler. Having run precisely one marathon prior, some masochistic-mid-life-crisis part of me felt I needed to try something that was beyond my own sense of reasonableness. 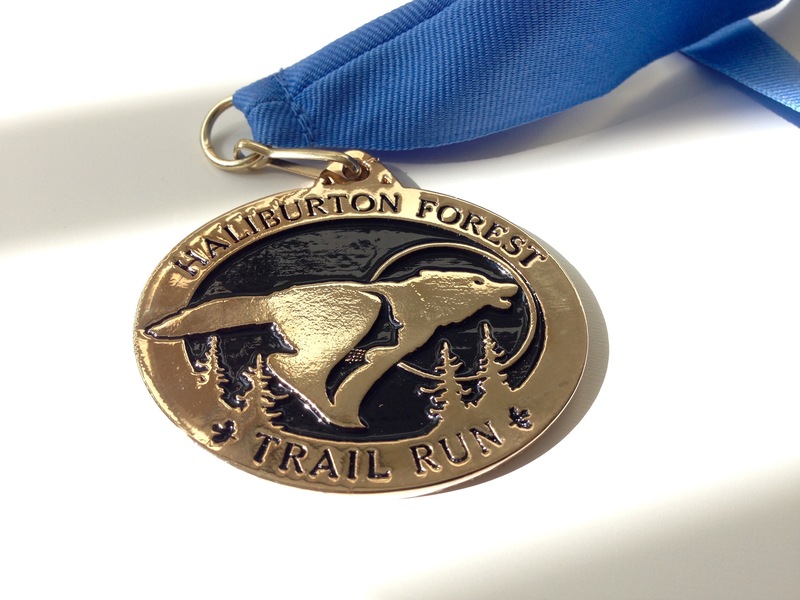 The Haliburton Trail Ultra worked logistically: good time of year for a long race, not too far from home, not too much elevation, so it was decided. But I waited until the last possible minute to hit the commit button. Perhaps I was waiting to see if a sudden injury, act of god or unexpected rash would swoop in to derail my plans. Or maybe I was just scared. Regardless, I found myself standing in the dark with a hundred or so other committed souls at 5:30 on a cool fall morning, waiting to plunge headlong into the unknown. Elise, my wife, and our two young boys had agreed to be my crew for the race, camp out, and maybe have a little fun for the weekend. Haliburton Forest is privately-owned and expansive: “80,000 acres of rolling hardwood forests, beautiful lakes, meandering rivers and extensive wetlands.” (from their website, and an accurate description) The entrance to the park and accompanying series of cabins give it a rustic “logging camp” look. It feels a bit wild, by Southern Ontario standards, and that’s a good thing. We arrived the night before with enough daylight left to pick up my race package, identify the critical locations (bathrooms), and set up our tents in the group camping area, which flanks a dirt road that would become the start/finish/100-mile turnaround “chute”. Did I mention that there was also a hundred-mile race? 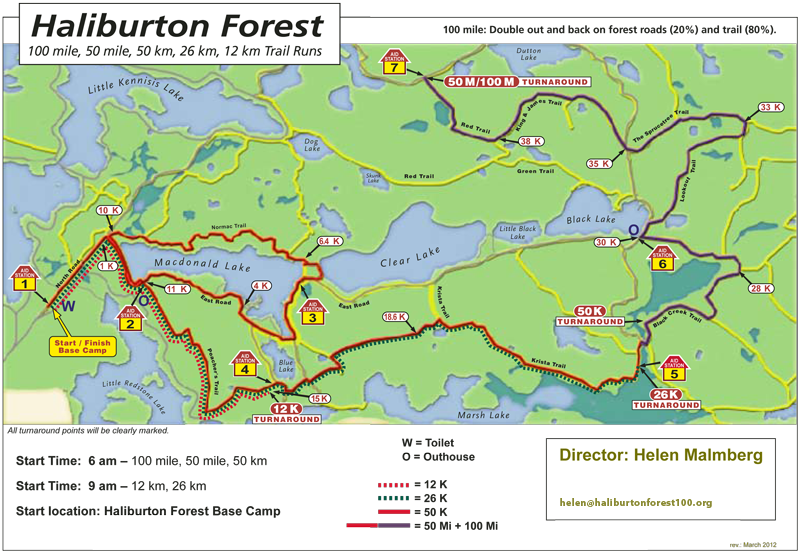 The Haliburton course is out-and-back on a combination of forest roads and trails. There are various distances to run, from 12 km to the signature 100-mile race, which requires you to complete the course twice. I had made up my mind, arbitrarily, that I didn’t consider a distance “ultra” until it hit the 50-mile mark. I expected that the “true” ultra experience could only be had if you ran 100. This 50-miler would help me determine if 100 was in the realm of possibility, or whether it would be my first and last foray into ultra distance. The night before the race, though, none of those thoughts mattered. It was just lovely to be out in the park as the sun set, with fellow runners milling about or sitting around camp fires, sharing stories from years past, some proudly sporting 100-mile hoodies from previous races. The mood was light, oddly calm, and friendly. As I waited outside the “comfort station,” the inky darkness, unpolluted by city lights, treated us to shooting stars and tiny satellites drifting by. “The best part about running a hundred-miler,” said an anonymous figure in the dark, “is when you are running in the forest in the middle of the night and you take a moment to look up. Will you be running at night?” he asked. “No, I’m doing the 50.” I replied. “You picked a good one,” said the voice before vanishing into the darkness. I felt wholly under-planned for the race. My strategy for reducing pre-race anxiety was to avoid thinking about it. So, as Elise and I sat in our tent with flashlights, I took my first really good look at the course map. From training, I knew I could run 40 or even 50 km with minimal nutrition – beyond that distance was unknown. We planned for my family to meet me at Aid Station 6 on the way out and 6 and 4 on the way back. That would put them at 30 km, 50 km and 65 km. The rest we would play by ear and I reckoned if I made it to 65 km, regardless of my condition, I could drag myself to the finish line. – run my own race, be in the moment, and enjoy! If I followed this race plan I figured one of two things would happen: Either I would get past the 50 km mark and things would get progressively harder, necessitating hiking, limping or crawling my way to the finish; or, if the stars aligned, I would find some deeply stored reserve which would allow me to joyfully skip to the finish. Okay, maybe not, but I could dream. As we snaked our way gently through the single-track, with the makeup of the group constantly shifting, conversation ranged from other races, V02 max and the durability of Fit Bits to the much-coveted but seldom experienced 100-mile midnight gnome sightings. “I’ve never seen gnomes,” said a voice behind me, “but I kept seeing lawn chairs.” The pleasant pace and chatter kept everyone gliding down the forest trail, barely noticing the slippery roots and rocks as they passed underfoot. Running for a long time will tug at your personality. It can pull out the best: “I am a Zen master. There is no one ahead of me. There is no one behind me. There is no finish line.” or the worst: “I’m gonna chase that guy down! I can run faster than this! They will all feel my wrath!” These vacillations can last for minutes, or even hours. When I was running with others, I could rely on their pacing to guide me. Now that I was alone, my brain was taking over, and though I am not a “fast runner” I am impatient. If left unchecked, I will start to run faster and focus on (read: lament) the finish instead of revelling in the journey. If there is one lesson I learned that day on the trail, it is that ultra running is about patience. No matter how fast you go, you are going to be out there for a long time. Practicing patience can mean the difference between enjoyment and suffering; between finishing strong or not finishing at all. “Patience. There is a long way to go. Just stick to the plan and keep putting one foot in front of the other.” This became my mantra for the rest of the day. 30 km arrived and my family was there to greet me. 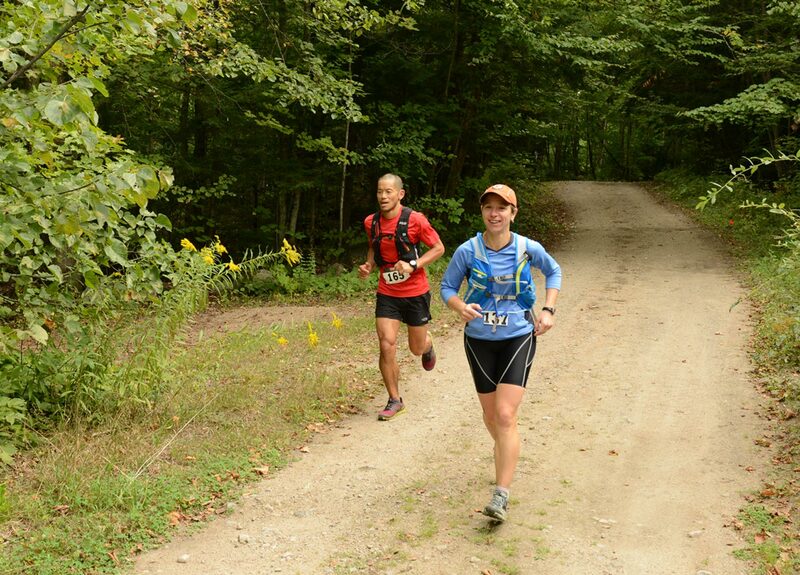 The Haliburton aid stations were great. I would describe them as happy, helpful oases that pleasantly punctuate the solitude and suffering one might experience along the course. The care taken with the wares was impressive and the volunteers were friendly people that genuinely wanted to help you. Having family there was a bonus that cannot be underestimated – say what you want about the benefits of sugary concoctions, a child’s hug or a spouse’s kiss can float you along as well as any gel. And they gave me cake. As race formats go, out-and-back courses are mentally tougher than point-to-point courses, but they do offer some benefits. Not only do you get to know the course features that you will encounter in the second half of the race, you encounter runners coming in the opposite direction. This allows you to cheer on and occasionally high-five your fellow runners mid-stride. As you approach the turn-around, it also lets you see who is ahead of you. 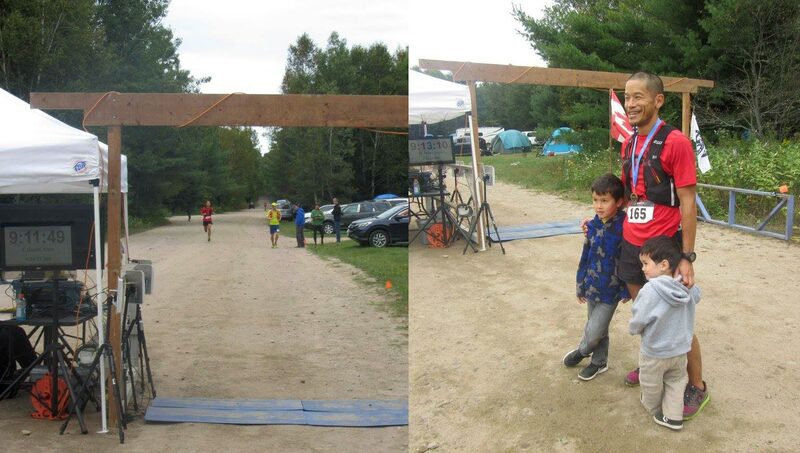 This first happened to me at around 35 km when the lead 50-miler (Benoit Labreche) came running towards me. I did some quick mental calculations “…about an hour ahead of me… that seems about right. He looks fresh.” As I moved steadily towards the turnaround, a smattering of others approached: green-shirted guy (Matt Smith) that I recognized from Endurance Tap (the Toronto-based maple syrup energy gel), a minimalist (shirtless guy) several others, and another shirtless guy (Jack Kilislian), all looking better than I was starting to feel. The turnaround point on the course is cruelly placed about 700 metres beyond Aid Station 7. You see the aid station, think you’ve hit the turnaround, then the bad news. Of course, when you do pass the turnaround, you get to see who is just behind you: another green-shirted guy (turns out his name is also Matt) and an Asian guy in black and orange whom I recognized from earlier because of the visor dangling from his pack. “That’s it! Half way! Next stop, family.” I downed a slice of watermelon and a paper cup of Coke, thanked the aid station folks and was off. Running really far brings into focus how “relative” distance and time are. If you’ve never run before, 5 km seems like a good distance, 10 km seems really far, and a marathon seems totally out of the question. But when you start training for an “ultra” distance, your short runs might be 15 km. Over time, banging out a half-marathon-length easy run starts to seem normal, and the prospect of running 40 or 50 k is no longer nausea-inducing. Relativity, though, cuts both ways (I think Einstein said that). 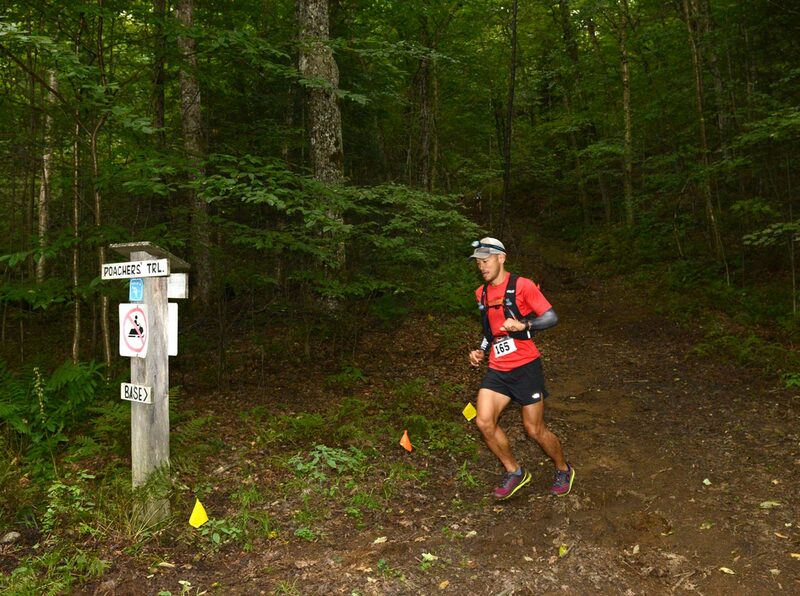 The longest distance between aid stations at Halliburton is the 10 km between AS 6 and AS 7. Relatively speaking, this section became the second longest 10 km I had ever run. Alone again, but not for long – footsteps behind me. On a curve I caught sight of green shirt Matt #2 gaining steadily, and then I was watching his back as he ran by me. Soon after, Asian guy (Do Tran) passed me looking like a possessed bumble bee. “I guess this is where guys are turning it on” the voice in my head said, but with 30 km left it was a risk I wasn’t willing to take: “Patience. There is a long way to go. Run your own race and keep putting one foot in front of the other.” So I watched them go. They remained in sight though, and eventually we all caught up with Jack. Do, smelling blood, charged ahead. We watched as he wiped out spectacularly, and then was up and off again. We wound back into the single track, the three of us remaining ran stride-for-stride, steady and content – content to let Jack set the pace, that is. We came upon Do again, and this time he was standing beside the trail, rooting through his pack. “You okay?” “Yeah,” he said, and mentioned something about equipment as we left him and trudged on through the forest. Do eventually caught up and we ran as four, still letting Jack lead the way. But as we approached an open descent, Do turned on the bumble bee again and barrelled down the hill, opening up a gap between him and the group. Trouble was, he missed the course markers. “Anyone going with him?” asked Jack. Honestly, I would have blindly followed Do if Jack hadn’t been leading. I would later learn that Jack Kilislian was an Ontario Ultra Grand Slammer, meaning he had completed three 100-mile races in a season. A solid veteran, he knew how to follow course flags. “Hey! Wrong way!” yelled Matt, before I could really even process what had happened. Somewhere behind us expletives were uttered. Between Aid Stations 5 and 4, at roughly 60 km, something of a minor miracle happened: I felt myself slowing down. Not becauese I was afraid of blowing up, nor because my energy was flagging. I was slowing down to avoid running into the back of Jack. Somehow I was beginning to feel good. Crewing a runner is a like parenting a teenager: you never know exactly when they’ll show up, and when they do, they might be cranky and demanding – and they’re always in a hurry to get out of there. I had asked Elise to meet me at Aid Station 4 (65 km) because I had no idea what was going to happen at that point. But by the time we rolled in, I knew what I wanted to do. “I’ve got to run,” I told Elise when she asked me what I needed. We stole a farewell kiss and I was off, feeling renewed energy and excitement. Jack wasted no time there either and it was a good thing, as in my excitement I was totally prepared to run off course. “You don’t want to do that.” Saved by the veteran again. For the next kilometre or so, I resumed my position behind Jack, but he could sense my nervous energy. “If you want pass, just let me know, otherwise I’ll just keep going,” he said. And with 14 km to go, it was time. “Okay, we’ll see how this goes,” I said to Jack as I passed him in an open section, “maybe you’ll see me later,” and then I ran. Some of the prettiest sections of the course are the long stretches of single-track that wind their way through deciduous forest. The trail in these sections is lightly rolling, rooty and technical and tests the brain as much as the legs. For the first time that day I was racing! I was dancing over rocks and roots, scampering up hills and, ouch! ouch! quads! descending carefully. Though I’d run much farther than ever before, I was feeling great and I was starting to get the scent of the finish. The next aid station would be arriving soon, marking the final 10 km loop around MacDonald Lake to the finish. When I arrived, the aid station captain said: “Go straight for about a kilometre, then turn right between the white signs. Around the lake and we’ll see you back here in about 10 k,” and it was perfectly timed, as at that moment, panting, I really needed someone to tell me what to do. The white signs marked the course for the 50 and 100-mile runners but they might as well have read: “welcome to the pain cave” as my late-race burst of energy was rapidly turning into a teeth-gritting ride on a lactic acid roller coaster. Along this ride I encountered another Ontario Slammer and shirtless guy, Steve Bridson, who asked me about Jack. They were tied in series points and Jack was his motivation to keep pushing. I told him he wasn’t too far back and pushed on, resisting the temptation to look at my GPS watch. “I must be almost there, I’ll just sneak a look… Dammit! Why did I look: 8 km to go…” Could I take a little break? I looked behind me. Nothing: No bare chests. No green shirts. No bumble bees. “I’ll just walk a little.” I run-walked my way to Aid Station 3, with 6 km to go, where I was greeted by a woman rapid-firing food and drink options at me like I was at an all-you-can-eat buffet. Her hospitality was lost on my lizard brain as I grabbed a final Coke and ran. And that was it. In the time it would normally take me to commute to work, put in a full day and come home, I had run 50 (!) miles. My first foray into ultra running was totally satisfying. The race went as well, or better than, I had hoped, the suffering was in the right places, and I learned a few things, both about myself, and about running very, very far. I can’t say enough good things about the event, its organizers and volunteers. People who have run this race are effusive about it, and for good reason. The course has plenty to offer with scenery, varied terrain, moderate elevation change, and not an inch of pavement – a difficult thing to find here in Southern Ontario. It is a small, intimate event that leaves you feeling like part of the Haliburton family, and it is put together with love: love of the land and for the people who keep coming back. Hats off to Helen Malmberg, race director, organizers and volunteers for putting on a great event, now in its 22nd year. Thanks to Elise and the boys for their support and patience, and thanks to David Collins and Jack Kilislian for the tips, and for allowing me to run behind them for so many hours. In the aftermath, only one question remains: will I return for the 100?